Imagine – Argentina – and the rest of Latin America – being urged by the EU, ultimate puppet of the US not to supply Russia with food stuff – vegetables, fruit, meat – after Argentina was ‘punished’ by a corrupt court in New York to pay 1.5 billion dollars to the fraudulent NML Capital et al vulture funds – out of its current agreed upon debt of US$29 billion – equivalent to Argentina’s total reserves. And yes, the hedge funds have to be paid 100%, when the remaining 93% of creditors agreed on a 20% reimbursement rate. – And, yes, Mr. Griesa, the bought NY judge, has blocked all of Argentina’s payments to the other creditors, unless his vulture clients are paid in full. So, Argentina is in forced default – having to pay now much higher interest rates on international money markets, if she is indeed still eligible for international credits. Under these circumstances, the boundless arrogance of Brussels expects Argentina to ascend to the US / EU sanctions on Russia to which Russia responded by banning all imports from the EU? – And is now seeking trading with South America? Not that Russia really needs food from South America – there is an enormous and willing Asia market open to them. Russia’s gesture is a helping hand to Argentina and South America to free themselves from the economic and political pressures constantly exerted on them by Washington. Argentina will laugh at such a ridiculously stupid request from the EU. Good for Russia – and good for Argentina, Brazil, Chile, Peru et al – to finally escape the claws of the predator empire of Washington and go the way of independence, namely towards a new area of economic sovereignty and world monetary system. Good for the BRICS (Brazil, Russia, India, China and South Africa), as they may finally come to a consensus among themselves and issue their own currency, backed by about one third of the world’s economic output and about half the world’s population. Of course, such a primitive move by the EU begs the questions – have the leaders (sic) of the EU, pushed by the unfathomably senseless mouthpiece of NATO, Fogh (of war) Rasmussen, lost their last shred of sense and sovereignty? – have they indeed degenerated to the level of brainless, spineless dummies? – Do they not realize that if they succeed helping Obama and his blood-thirsty NATO war machine engaging Russia in WWIII that their countries with the countless NATO bases will be the first targets of Russia’s defense? – I.e. – Europe being destroyed – again? Don’t they realize that Russia, after having been the key liberator of Europe from the Nazi WWII fangs – at the cost of 25 million Russian lives – that Russia not only wants to save Europe from another humanitarian disaster, but would like to help them out of their Wall Street imposed economic disaster by trading with Europe? 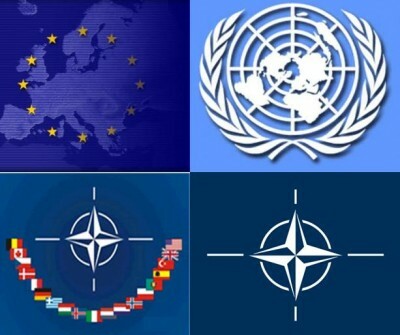 – That Russia and China would like to form an alliance with Europe – a peace alliance not war alliance à la NATO? Can’t they – the EU, see the light after Mr. Xi Jinping, President of China traveled to Germany to offer Madame Merkel this spring a New Silk Road, linking Berlin with Shanghai? – An extraordinary potential for economic development throughout Asia, away from the decaying war driven economy of Washington, the Pentagon and the ultra-corrupt financial system dominated by Wall Street the FED and the BIS (Bank for International Settlement)? Argentina and the other Latin American countries invited by Russia for trading food and other merchandise – most likely will see the light. If the BRICS are not yet ready with an alternative, dollar delinked currency to replace the western predatory money machine, Russia and China are. The two countries have forged a solid political and economic alliance during the past few years, have a combined GDP of US$ 21.1 trillion (China – US$ 19 trillion; Russia US$ 2.1 trillion – est. 2014), equal to about 27% of the world economic output – US$ 77.8 trillion (est. 2014). Russia has already announced that the ruble is backed 100% by gold – which is not a reference in itself, but enhances the solidity of their countries’ manufacturing and construction output. This compares with a US GDP of US$ 17 trillion, mostly based on the output of the war and security industrial complex, meaning a GDP of destruction – and on consumption, as well as hollow financial and legal services. While the BRICS are getting their act together, it is conceivable that Russia and China will issue shortly their own combined currency – the ‘Ruyuan’ or the ‘Yuanru’, delinked from the corrupt, predatory western monetary system; a new monetary alliance could also replace the dollar as reserve currency. Controlling more than a quarter of the world’s economic output and a majority chunk of the Asian market, a combined China-Russian currency would have an infinitely more solid backing than has the fiat dollar – as well as meanwhile also the fiat euro – to become a serious reserve currency. – It is only a question of time until much of the rest of the world will jump on the occasion and abandon the dollar. All it needs is one country that dares to take this first step – fearless of sanctions, as they are meaningless under a news monetary system. Argentina could become the first country to free itself from the economic sledgehammer of the immoral United States – and at the same time enter into trade agreements with Russia and China. Already today 90% of Argentina’s foreign trade takes place outside of the realm of the US dollar. The question that begs asking is – what will eventually Europe do, when it realizes that it is living on a house of cards that can crumble – and crumble it will – at any time? – What will happen to the Wall Street-FED-Troika (IMF, ECB, EC) lynched Euro, when the people who invented the dollar degenerate into mere brainless greed and war machines? – When they become incapable of thinking by themselves, of recognizing their sovereignty – the highest asset any organized society can claim for itself? Will eventually the peoples of Europe stand up and get rid of their Washington imposed neoliberal fiefs, grasping the breath of fresh air coming from the East and seeking a healthy alliance, striving for peace and human rights? It is never too late. Argentina could well become the cornerstone for a new era. Peter Koenig is an economist and former World Bank staff. He worked extensively around the world in the fields of environment and water resources. He writes regularly for Global Research, ICH, the Voice of Russia, Ria Novosti and other internet sites. He is the author of Implosion – An Economic Thriller about War, Environmental Destruction and Corporate Greed – fiction based on facts and on 30 years of World Bank experience around the globe.